360 pages | 73 B/W Illus. The use of food texturizing agents, such as gels, thickeners, and emulsifiers, has been steadily increasing in the culinary industry. Understanding how to use these texturizing agents is important for chefs of all levels, from professionals to culinary students and amateur cooks. 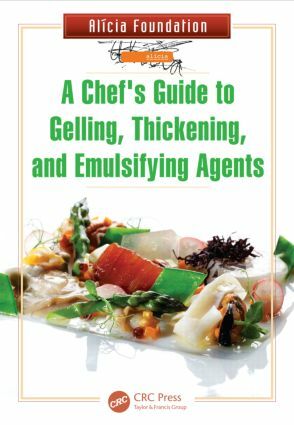 From Alícia Foundation, the culinary research center driven by famed chef Ferran Adrià, A Chef's Guide to Gelling, Thickening, and Emulsifying Agents provides a clear and practical guide for any chef who wants to work with these texturing agents. Collaboration between scientists, technicians, and chefs has resulted in unique and creative culinary uses for many commonly available food texturizing agents. The information in this book is a collection of years of culinary scientific research and the experiences of a diverse group of chefs who are eager to share their practical knowledge and recipes. The book discusses more than 20 carefully tested gelling, thickening, foaming, and emulsifying agents. This book presents each texturizing agent in a simple and practical format. For each agent, the book includes a description of its principal characteristics, easy-to-follow instructions for use, helpful handling tips, and a sample recipe. The Annex includes tables listing all of the texturizing agents, summarizing the relative effectiveness of their gelling, thickening, emulsifying, or foaming properties. These tables can be used to compare the agents by category and functionality. "The use of food texture modifying agents, for gelling, thickening, and emulsifying purposes, is continuing to increase in the culinary industry. An understanding of the use of such agents is therefore of increasing importance for chefs at all levels within the industry. This volume from the Alícia Foundation (a culinary research centre in Sant Fruitós de Bages, Barcelona, Spain) provides a clear and practical guide for individuals working with such texture modifying agents. … this collaboration between scientists, technicians, and chefs has resulted in a unique, creative, and interesting volume that not only discusses the main characteristics, product varieties, and uses of these commonly available products, but also demonstrates their application in high-end restaurant cuisine. This volume will be of interest and direct use to individuals involved in all aspects of the culinary industry…." How Does a Gelling Agent Work? What is a Thick Texture? How Does a Thickener Work? How Do Foaming Agents Work? How Does an Emulsifying Agent Work?